When a day is frustrating and you’ve had little rest, every tiny thing can throw you into despair. Things look gloomy, there is no light at the end of the tunnel, and all you want is some peace and time to regroup, which seems impossible with work, chores, and children competing for your attention. And then someone breaks a dish, or cuts you off in traffic, or destroys a project you’ve been working on. And you are on the brink of losing it, screaming your head off, or just giving up and walking away. Take a deep breath. Take a step back. We cannot control other people, and can only control our own environment to a certain extent. What we can control is how we perceive and react to things around us. There will be spills and broken dishes. 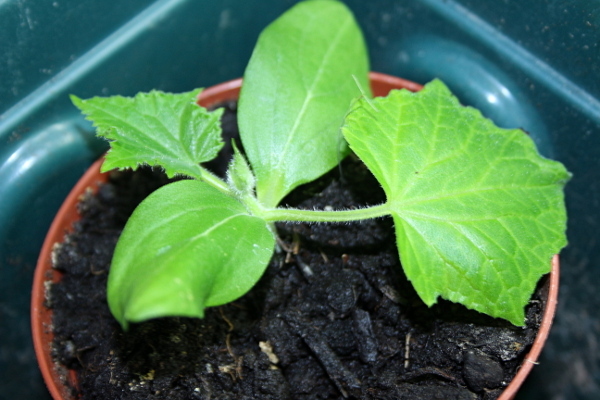 There will be rabbits and other wildlife eating seedlings you spent many a night nurturing. Someone will cut you off in road rage. You’ll hear snipe, inconsiderate remarks towards you or your family when you are out and about. Consider whether you want to bring that into your space. Choose when to stand up to it and counter the hurtful comments and when to ignore them. Reflect on why someone cuts you off and what their state of mind is at that time. They are clearly aggressive and unbalanced at that moment — realize that you do not wish to share that feeling, and shrug it off. Clean up the spills and the broken pottery, while realizing it’s a blessing no one was seriously injured. 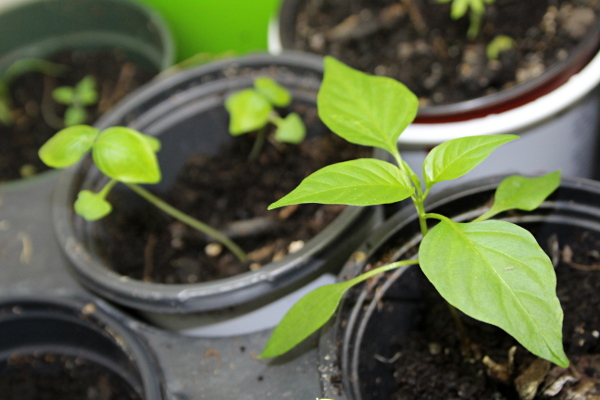 Smile at the critters eating your seedlings — at least, your plants are feeding someone. Perhaps, next planting season, you can come up with a way to keep wildlife from the plants with a mesh until the seedlings are well-established. In the long term, aim to get more sleep and nourishment, control your environment to encourage a productive and creative atmosphere, and take some time for yourself, to rest and regroup. We often get unbalanced when there has been little time to process all the information that overwhelms us every day. Let go of what you cannot control and make a difference where you can. You cannot do much about an aggressive driver or a broken dish. You can hug your child, pet someone furry, take a walk outside, thank your garden for bringing you its bounty, even if reduced by sharing with wildlife. Appreciate your reality, and let the small things go. How often have you come home feeling stressed and tired after a long day, with the only thought of plopping down on a couch and not moving for the rest of the evening? Traffic jams, errands, being bombarded with information, work demands, and interactions with the world around us often leave us feel drained, tired, and unmotivated. Add to it inability to fully rest if you have children that need your attention, and having a restful or a productive evening might seem impossible. My answer? Grab a snack or have a quick dinner, and head to a nearby park. Depending where you live, you might substitute another place with trees, fresh air, and a playground or another way for your children to amuse yourself. Near our new place, there are three parks with play structures, from simple to elaborate, and the kids love all of them. They stretch out stiff muscles after classrooms and car rides, and release the last remaining energy after dinner, so that when we start the bedtime routine, they are ready for a rest. 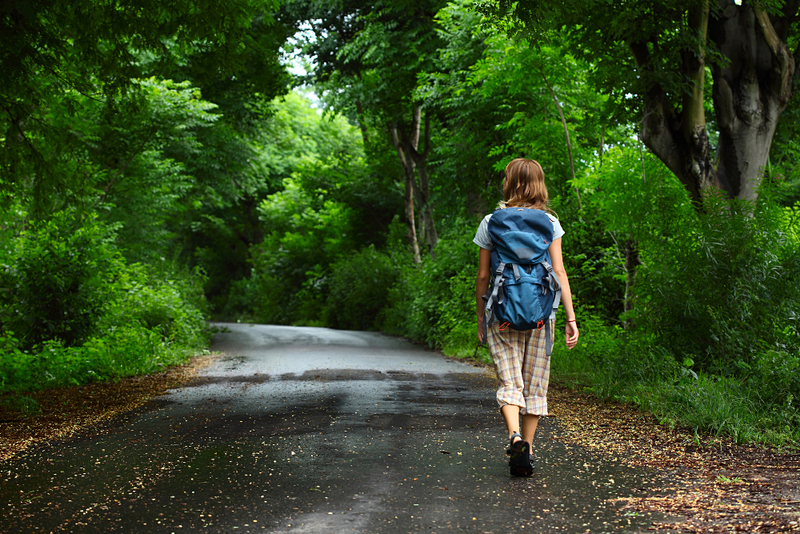 Being outside helps you reset your mind from the worries of the day, from work and chores. You can breathe deeply and connect with nature. 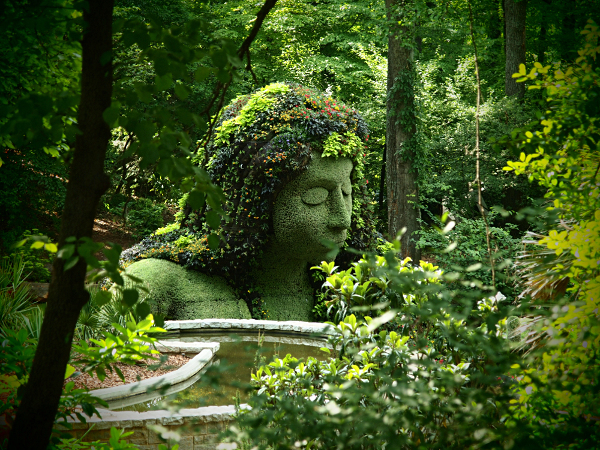 There are studies that show that being in green spaces promotes health and longevity. I love walking barefoot on the grass, to connect with the ground and let my feet rest from footwear. You can stretch your own stiff muscles, and you’ll often find that the weight of worries on your shoulders melts away. 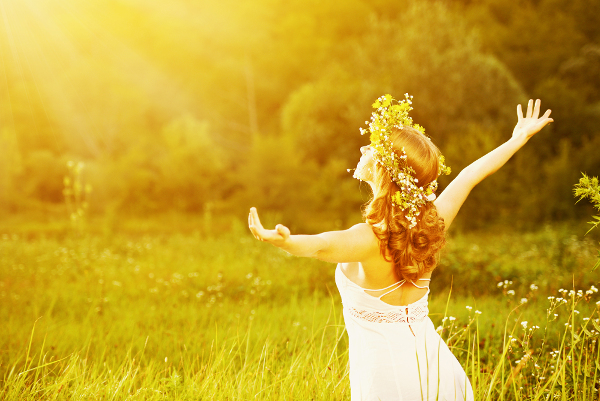 Once you’ve breathed deeply and relaxed, you may find you feel new energy coming on. Indulge yourself: use monkey bars and ladders on the playground, crawl through pipes and go down slides, play with your children, do some pull-ups or squats, run and jump, play in the sand. Play is rare in our adult lives, but it is very important for our overall health and well-being. It’s also a great way to get some of the much-needed movement into your often largely-sedentary day. 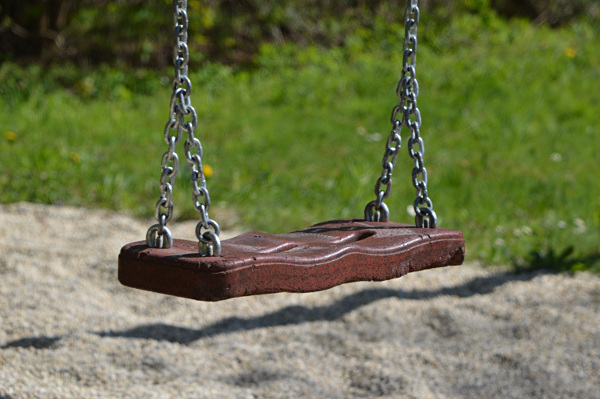 Katy Bowman has a great short video on 30 things you can do at a playground. If you find yourself if a more introspective mood, you can watch other families play and interact, observing different games people play with their children. You can chat with another family — meeting new people in your neighbourhood may mean a new friend for you or a new playmate for your children. There are lots of games in which you can participate with your children, your partner, or other families: bring a frisbee, a ball, a jump rope, a bicycle, a hula hoop, or a badminton set. Cool off in a splash pad if there is one in the park — they are great in summertime. Take a turn on the swing — the changes in visual perception and the exhilaration of movement are great ways to shake off the day’s exhaustion. Soon winter will set in with cozy evenings at home with hot tea, books, puzzles, and board games. Enjoy the warm sunny days while they are here! In social situations, we interact with many people who may be passionate, harsh, insincere, expressing intense emotions, raising difficult questions, or trying to stir up our negative feelings. Most interesting people are often very complex. Many activists, for instance, have strong, unforgiving standpoints and are very firm in sticking to their guns without a care that it might hurt or offend someone else. Some people are harsh yet brilliant, and while appreciating their commentary from an intellectual standpoint or valuing their contribution to a common cause, one needs to actively abstract away the other aspects of their personality, their non-constructive comments or personal remarks. Often, we can tell more about the state or character of the one asking a question or expressing an opinion than about the person whom that question or opinion is targeting. Other people might flood you with a stream of consciousness, without filtering any of it out, expressing their perception of the world blended with assimilated perceptions of other people, all the while commenting on their own emotions and opinions. It takes energy and concentration to peel away the redundant and irrelevant layers to extract the gems of insight, if such are present. It is often educational to listen to such a flood of thoughts, however, as it closely follows the thinking process of the person expressing it. It is valuable to see how people form the opinions they hold and how their reactions are shaped by people and events around them. Many of us have had a dream that was so vivid that it took a while to convince ourselves after awakening that we had not just lived through it in the real world. Our mind treats the experiences we have truly gone through and those we have imagined in detail as equally real, and the emotional response to either can be strong. As an empath, listening to someone’s emotional account of a situation, I tend to find myself slipping into their shoes and taking on their place in the narrative, along with their emotions and opinions. If I am not careful, after the encounter, the lingering emotions can shape my perception of reality in ways I do not intend. I have to consciously process the conversation and take away only what I find constructive. As those of us who have gone through unmedicated labour and birth can attest, the challenges we go through during labour soon fade away, leaving behind the glorious oxytocin-induced feeling of birth being a wonderful, overwhelmingly-happy and empowering experience. Hormones help us there, ensuring our species does keep procreating. Our mind is selective in what to associate with birth and what to remember about it. Similarly, we choose what to associate with and remember about people. My grandmother was quite ill for the last several years of her life. When I went overseas to see her, she lamented that I would remember her in this state, forever suffering. However, even before that, my mind has firmly associated her with the way she was in her early 60s when I was spending every weekend at her place. She has been shaped by captivity during the war, followed by harsh, cold years in the Russian North where she gave birth to her two children, then by settlement in a completely unfamiliar million-people city in the South-West, and the early tragic death of my grandfather just months after I was born. I will always remember her that way, because to me that is who she was — a strong, hard-working, wise woman, immensely loving, and fiercely devoted to her family and friends. With any experience, real or imaginary, we choose how to interpret it, what to retain, and what to take to heart. We cannot always control what happens. Shape your reality by what you choose to remember. When we have a large project on our mind, we often make it out to be more intimidating than it is. We think it is harder, more complicated, and will take a lot of time. We wait for that “right” day when we have 8 hours without interruption to even tackle the planning of it. As a result, the project gets postponed indefinitely. We end up procrastinating, instead of studying for an exam, executing a work project, completing a home improvement. All you need is a short planning session and the right attitude. You’ll be surprised how soon you can cross it off your to-do list. This weekend, in 3 hours, we have tackled the garage organization — a project that some people are dreading for months. 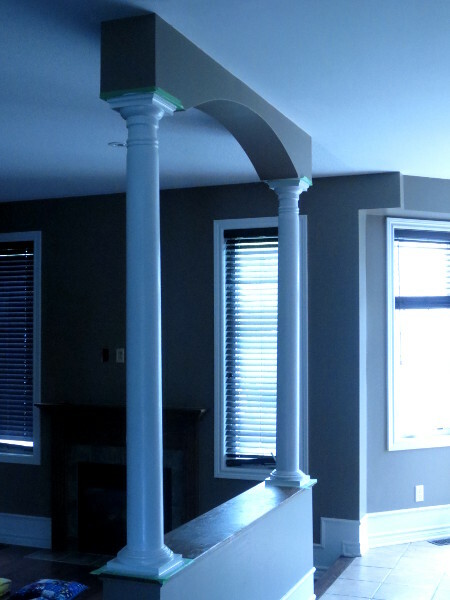 Our place has gone through a large renovations project (ripping out all carpets and replacing them with hardwood), which did include external contractors and required a lot of coordination and some material sourcing on our part. We have unpacked all the boxes from the move, so we now know where everything is. We have organized all the living spaces efficiently, including children’s clothes and an effective workspace. 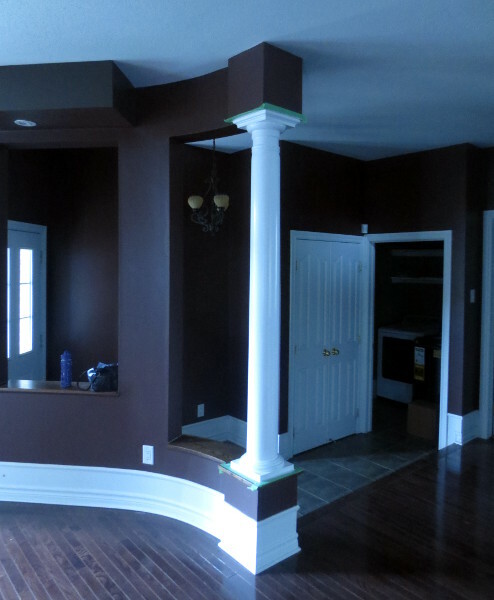 We have washed all windows (inside and out), baseboards, floors, cabinets, and dusted all the walls and ceilings. I have washed more windows this summer than I have in the past 20 years. We have had a full-house water filter, a drinking water filtration system, and a central vac installed. 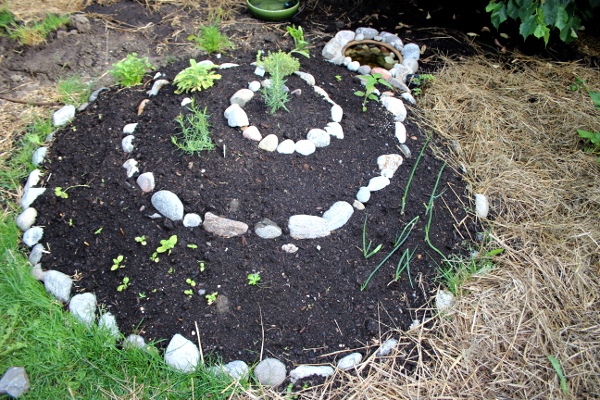 We have a lovely blooming and fruitful garden, including a permaculture herb spiral, which got planted in 2-3 weeks after we moved in. Through all this, we have been spending lots of time working outside of home, playing with the kids, inside and outdoors, eating healthy meals (most of the time), entertaining guests, and hosting a housewarming. Of course, there are other projects we would like to undertake in the future to make the place more suited to our needs, more aesthetically pleasing, more comfortable. This, naturally, will take more time and planning. But as long as we approach it without being overwhelmed, they will all be completed and not cause excessive stress. Step 1 – Plan execution steps and resources. Identify the smaller tasks that comprise the project. In the case of small projects, this could be 2 or 3 tasks. In the case of larger projects with steps depending on completion of previous steps, it requires more careful planning. For each task, identify the time, the materials (if any) and the help it would take to do. The more you think the project through at this stage, the easier executing it will be. However, don’t get bogged down in details or trying to make a perfect decision. You might end up researching until you are blue in the face and unable to decide between alternatives that some praise and others condemn. Research enough to make a decision that makes sense to you. Move all the items that shall not stay in the garage to the basement. Most of the items we use day-to-day are already occupying their appropriate places in the house. The basement has been designated as the storage area for more delicate things that cannot survive the garage or those that will need to be more accessible in winter. This would only need us to identify these items and move them. Easily done with 2 people and about 15 minutes. Remaining items would occupy shelving units. We had two already completed and placed and two more waiting in the middle of the garage. Our biggest obstacle was a large pile of firewood, taking up space all along one garage wall, where the shelving units would need to reside. This step needed us to plan where the shelving units would go and decide what to do with the firewood. The discussion and decision took about 5 minutes. We knew that to organize the items piled on the floor, we would have to put up the shelving units along the wall, for which we would need to move the firewood out of the way. The firewood would then need to be stacked higher in the smaller space next to the shelves. The biggest undertaking appeared to be moving the firewood away from the wall and then stacking it back. This seemed so daunting that we were tempted to keep putting this off, our biggest challenge being that when we are both home, both our children are home as well. They rarely nap at the same time these days and having either of them in the garage while we clean, among various unsafe items, would not have been possible. Thus we needed an awesome nap time (unlikely) that would give us 2-3 uninterrupted hours, or someone to watch the children while we were working. We knew the time, we knew the execution plan, we needed child-minding help. 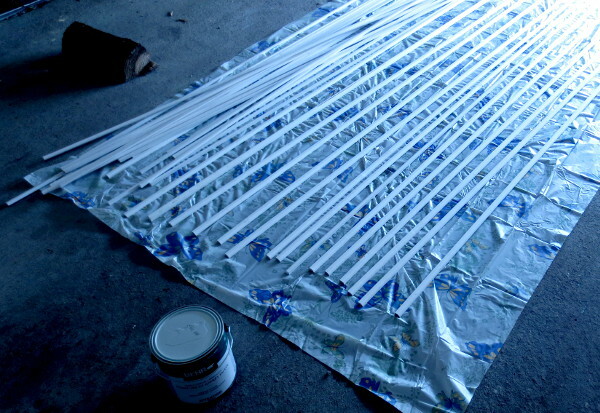 Step 2 – Acquire materials. Source what you need to complete the project. This might include assembling existing items, renting, borrowing, or purchasing equipment and supplies, finding knowledgeable people to advise or help you. Breathe deeply, don’t get overwhelmed with lots of things that are needed. Tackle them one task at a time — plan what is needed for each step and find out where to get it. For our garage organizing project, we had to assemble the shelving units. The rest was just physical work to be done. Don’t stress the small stuff – you can tweak the details as you go. For instance, we didn’t know what we shall place under the newly stacked firewood to prevent it from getting wet. The existing rails appeared too long to work with the shelves in place. Once we have removed all the firewood from its original place, we have discovered that we can reuse some of the shorter metal rails that were buried under the pile. Step 3 – Think in terms of the time that is available to you. We took up the first two steps (moving away items that obviously did not belong in the garage and deciding on the placement of the shelves and firewood) when we had 5-10 minutes of quiet time here and there. Don’t underestimate the power of short time intervals. Clearing away extraneous items before you get started on any project will help you focus better in the field of work that remains. Step 4 – Seize the opportune moment. My mother was coming to visit from out of town for a couple of weeks at the end of summer, and this was the opportunity for having 3 adults, one of whom could watch the children and the other two take care of the physical labour. We have spent the morning playing with the kids and taking them on a grocery shopping adventure, which resulted in two tired, happy children who gratefully went down for a nap after all the excitement. My partner went to run a couple of errands, while my mother and I proceeded to clean the shelving units, move the firewood away from the wall, and sweep the floor. By the time he got back, the wall was clear and ready for everything to be organized. We proceeded to place the shelving units and to organize: more frequently used items were placed in locations closer to the inner door, and less frequently or seasonally used items (such as car maintenance and gardening supplies) were put on the newly-placed shelves. Afterwards, we have re-stacked the firewood, and were in the last stages of clean-up when the children woke up, so my mother went in to play with them. My partner and I then spent about 20 minutes sorting through a few remaining boxes and deciding what goes into the house, what stays in the garage, and what needs to be laundered. It then took him another 10 minutes or so to shuffle things to where they needed to be, while I joined my mother in taking care of the kids. Make it into a social occasion and combine activities for added benefit. We ended up spending lots of time with the children during the day, and had a good workout session while socializing with my mother. In the morning, we marinated some shrimp and chicken, so, after the garage project, we had a lovely afternoon in the garden, making some kebabs, and collecting greens, herbs, and cucumbers for a salad, all of which was then gladly consumed by everyone. As the above example clearly shows, it is difficult to do certain things without external help. If you, like us, don’t have family help readily available, you can either plan for when the family is visiting or find a way to get help. I have recently come across a brilliant arrangement mentioned by Katy Bowman in her Community podcast episode: rotating time with families helping each other around the house. The idea is that, say, four families (usually including children) agree to help each other. First weekend, everyone gets together at the first family’s house and helps them do whatever needs done: cleaning, cooking, organizing, planting a garden, renovating, etc. In the meantime, one of the adults (or two, if you want to make it more social) is watching the children. People can switch up, as long as everyone is contributing to completing whatever tasks need doing. Everyone brings a dish or two, so that the afternoon can end in a potluck, to celebrate the completion of the work. Next week, the four families repeat this in the second family’s home, doing whatever needs doing there. The next two weekends, the remaining two families get help. Work goes faster with more hands, you have a variety of skills at your disposal, people are socializing, children are playing together in a new house (which, as everyone knows, is way more fun than the same house day after day), and everything gets accomplished. I’d love to try this arrangement out. I confess, I’m guilty of having 2-3 projects on the go at any given time. It is handy to overlap material sourcing stage of one with the planning stage of another, for instance, but it is much easier to focus on one project at a time, especially if you tend to get very stressed out or have limited time intervals due to other endeavors. This post has become rather long, as I really wanted to illustrate each point well. Don’t be afraid to tackle larger projects. To get to an organized garage, all we needed to do was plan the steps and resources needed to complete them (time, materials, people), do whatever prep work we could in shorter time intervals available to us, execute the most complex step when all the resources were available, and celebrate the project completion. Make it fun and don’t forget to celebrate. The success of one project will inspire you to tackle the next one. It’s not as hard as you imagine. You can do it! We are creatures of habit. It is so easy to fall into repetitive familiar patterns and end up getting bored with your reality. So many of us get up, go through the motions of getting ready for the day, get the kids ready, follow the same work/eat/parent cycles, and end up turning to a familiar TV show or Facebook in the evening, to pass the time until sleep, only to start the same round of activities tomorrow. Needless to say, such a lifestyle does not spark creativity, make your days exciting, or have you looking forward to waking up in the morning. Feeling locked into a routine? Break it up! The first step is the most difficult psychologically — we are inclined to fall into familiar patterns instead of venturing out into the unknown. Your routine will still be there tomorrow to lean on if you need it, so shake off its chains and take off on an adventure. Join a club: reading and discussing books, playing a sport, beading, crocheting, cooking, yoga, dance, exercise. You can learn a new skill and meet new people. Try a new hobby: assemble a jigsaw puzzle, paint, dance, sing, play an instrument, draw, read, build models. Undertake a project that interests you: you can try anything from robotics and technology to improving your house or garden. Anything that gets you excited about the process and the outcome is great. Train for a marathon or another physical challenge: a friend of mine has just embarked on a 12-week course to restore her core strength and pelvic floor muscles postpartum, and she is finding that the entire family, including the dog, is enjoying the new activities. Take on a martial art, dare to try parcour, join a sports team, try belly dancing or zumba, or find a ping-pong partner — the possibilities to improve your physiology while having fun are numerous. Expand your horizons: visit a gallery or a museum (great with kids), go to a concert or a play, attend a film screening. Look for independent films on a topic you are interested in, such as CHOICE! Film festival and you can connect with like-minded people and learn a lot. Host a get-together: having people over can reset your energy. Arrange food (cook or do a potluck), drinks, and music, barbecue if the weather allows. Get-togethers are great to reconnect with people you haven’t seen in a while. Learn what they are into lately — you might find a new exciting activity to join or re-kindle your passion for a forgotten hobby. If you want to make it more engaging, host a theme party. Meet with friends for lunch or a playdate, at a pub or a cafe, for a parenting meeting, with or without kids. Go for a walk — step outside your door and take in nature, breathe deeply. Sometimes all that’s needed to break the routine is to lift your head up from a repetitive activity and take a fresh look at your surroundings. Recently someone has shown me the following video depicting nutritionally-empty mud cookies being made, sold, coveted and consumed by people in a society where food is extremely scarce. It reminded me of an old saying, “I cried because I had no shoes, until I met a man who had no feet”. We in the West are revolving in a stressful reality we ourselves have created and are often feeling like we can’t ever reach the place we want to be. It helps to slow down and consider how lucky most of us are. Here are some things you can be thankful about today. Perhaps not all of these apply to you personally, but most of us can be grateful for quite a lot. Ability to see, hear, walk, and think — those of us who have had one or more of those abilities impeded, appreciate immensely the world of opportunities good vision, hearing, mobility, and reason give us to experience life. Enjoy beautiful music and images around you. Cherish being able to go for a walk in nature, surrounded by green leaves whispering in the wind. Fresh drinking water — recently-threatened by climate issues and overzealous corporations, most of us take it for granted. 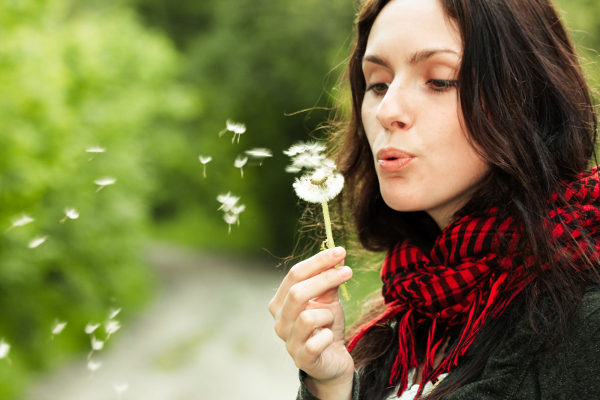 Fresh air to breathe — consider people who work in a coal mine or live near heavy industrial areas. If you are able to walk outside your door and take a deep breath of crisp fresh air, you are fortunate. If you can enjoy a sunset without a smoke halo, drink in the view. Ample food — many people in Western societies have an abundance of food, so much so that we are wasting 40% of the food we have. Appreciate every morcel of fresh, delicious, nourishing real foods. Roof over your head — we have removed ourselves from the harsh realities of the weather, be it freezing cold, suffocating heat, soaking rain, or bone-piercing wind. If you have a shelter, be thankful for it. No censorship on literature — coming from Soviet Russia, I vividly recall the echo of Samizdat and the value of rare banned books. Appreciate the availability of printed information on many points of view. Human rights, liberty, informed choice — although implementation is somewhat behind the theoretical tenets, we do have many liberties and rights that are not present in other societies. Way to contribute to community — we have many ways to help each other with resources, time, skills, and compassion. Lending a hand at the time of need is a powerful stress reliever and can bring satisfaction and sense of meaning. Leisure time — most of us are not working over 10 hours every day of the week and do not have chores that take up all of our time. We can choose to spend our leisure time on all kinds of intellectually and emotionally stimulating endeavors. Loving partner, parent, friend — most of us have at least one person in our life who supports our ventures, helps us at times of difficulty, and shares our joys with us. If you are lucky to have such a person in your life, cherish that relationship and express your love and gratitude to them often. Healthy, happy children — those of us who have dealt with difficult times in our children’s lives know how uplifting and joyous is the time when everyone in the family is contentedly playing, learning, and laughing. Do not take those times for granted. Speak softly love to your children. A welcoming home — if you have a home you love and care for, appreciate that many people live in places that do not feel like home to them. Coming back after a tiring day at work, smile at entering your abode. There is a Russian saying: “At home, even the walls heal you.” A welcoming home recharges us and helps melt our stress away. 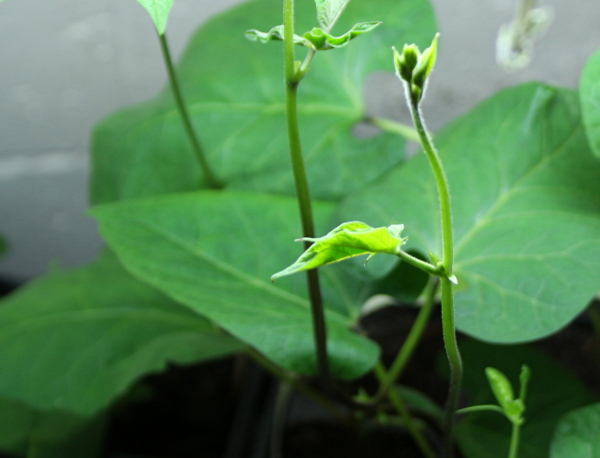 Fertile garden — if you have ever grown your own herbs, vegetables, fruit trees, or flower plants, you know how rewarding it is to watch the green life unfold and bloom, and witness the fruit grow and ripen. Cherish the bounty that comes from the land: not everyone is so lucky to have access to fertile land and water. Step back and look at your life from an outside perspective of people who are not as fortunate to have what you have. Focus on the positive. Rejoice in the things you have, develop a gratitude ritual, and you will find that less significant things do not shake you up as much. Control the noise and light pollution as much as possible. Your environment has a significant impact on how effectively your brain works: introduce too much sensory input, and the brain will work hard at trying to push it to the background, in order to concentrate on the work at hand. This same energy could be spent directly on the work. Too much noise and light pollution drain our energy, making us tired sooner and reducing our ability to work efficiently and enjoy the process. Control your atmosphere. Limit external interruptions as much as you can. Depending on your work, you might have to be interrupted to a greater or a lesser degree. An administrative assistant or a receptionist who has to take phone calls or answer email and in-person inquiries throughout the day will be more interrupted than a software engineer. If you need to make phone calls, do it in blocks of time, so that for the rest of the day you can focus on other work. If you need to communicate with others about something you are working on, compile a list of questions and have a discussion about all of them at once, as opposed to interrupting each other throughout the day. Ask your colleagues to do the same. Set up a reasonable system within your environmental constraints. Limit self-induced interruptions. Don’t have Facebook or news sites open and informing you of every single new comment or news story — you’ll never get any work done. Instead, if you want a break, check the updates once or twice a day, during breaks or lunch, to unwind and reset your mind. 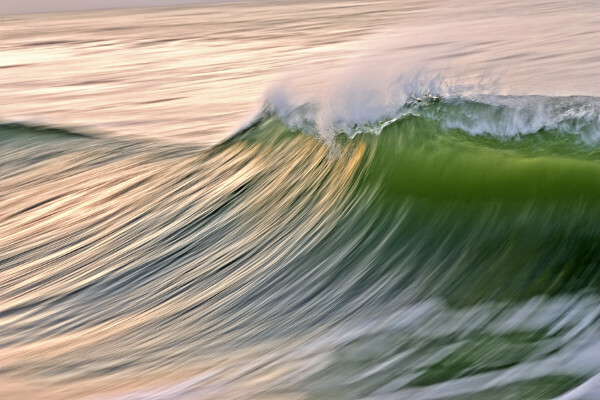 Don’t let it become a two-hour mindless surfing session — it’s a sure way to emerge on the other side emotionally drained, overwhelmed with information, and distressed with the sinking feeling that you just wasted hours of your life on nothing useful. If you work at a desk job, address the dangers of prolonged sitting. Bring a yoga ball to sit on or a yoga mat to periodically stretch. Find a way to take walk every now and then — getting up at least once an hour for 5-10 minutes is important, as all kinds of health deterioration is associated with prolonged sitting. Go for a brisk walk around the block or just step outside for a few deep breaths, use the washroom, get some water or tea, do a few stretches. If you work outside the home, the washrooms are often stocked with antibacterial soap with hot pink dyes and fragrances. Bring a natural soap without antibacterial chemicals — you’ll be washing your hands often throughout the day, and your hands will thank you for taking good care of them. Introduce something green to your workplace: a plant or a flower in a glass of water. If you work in a place with natural sunlight, you have lots of options. If your workplace is dim, as in a basement or a windowless office, some plants can still thrive there — devil’s ivy did quite well in my previous dark office space. If you work at a computer, raise your monitor (or multiple monitors) to eye level. You can get monitor stands or just prop them on piles of books. Your head, neck, eyes, and back will have less stress if you are looking straight ahead instead of craning your neck down. Wear comfortable footwear with no heel (and I mean completely flat, not even an inch) — look into Vibrams or other minimal footwear. Or ditch the shoes altogether — if you are sitting at a desk, no one sees your feet anyway. You won’t be shortening your calf muscles, which will in turn alleviate issues with your hips, back, and pelvic floor. Katy Bowman has lots of good information on why heels gotta go. Bring a scarf, shawl, pashmina, blanket, or sweater to have another layer of temperature control. Many offices are cold in winter (at least in Canada), and freezing in summer, since people dress for outside +30°C and the air conditioners bring the temperature down 10 degrees or more, with drafts (especially where people share the building with computers that need to be kept cool). When your body has to work at keeping itself warm, your brain is not dedicating as much capacity to your work as it could in a comfortable temperature. Bring healthy snacks to stash at your workplace: dried fruit, seeds and nuts, home-made energy bars, dark chocolate. It’s too easy to get lost in work and realize too late that you are famished and there’s no time to go out and get anything healthy (or your office is in the middle of nowhere and the only fair around is junk from a gas station). If you don’t have healthy snacks ready, you can easily fall into a trap of grabbing the sugar-laden ones from a convenience store nearby. Snack in moderation — even though these things are better for you, there is no need to overindulge. Keep these for emergency times only. Bring healthy lunch and fresh snacks every day (and when you fail to plan, you will have your stashed ones to fall back onto): dinner leftovers and fresh fruit and veggies are the best. Bring cutlery if none is provided by your office, wash it after lunch and keep it at your desk. There are few things more frustrating than opening your home-made lunch and realizing you’ve forgotten the utensils. Bring a water bottle with clean water — not all offices have clean tap water or a good water filter. In many places, bottled water is of worse quality than tap water, so save your money and don’t buy bottled water unless you are somewhere tap water is not safe for drinking. Bring a mug you can keep at your desk and a few different teas you enjoy. It’s great to have a refreshing cup of green tea during a hot summer day, or a cup of hot black tea on a cold winter morning. Your mug will make the place feel more like home and can serve as a focus point when you need to shake off frustration and reset to a productive mindset. Bring a box of tissues — it’s very handy to have for any spills, to use as a napkin, a wrapper, or a handkerchief. Bring headphones if your work requires concentration. Headphones can serve as a reminder to people around you that you are “in the zone” and might not want to be interrupted. They will think twice before asking you a question directly, often opting out for email or instant messaging as a more gentle way to get your attention. In fact, some software companies make it a part of their code of conduct, to reduce interruption and increase productivity. These are a few tips that I have found helpful. What are you favourite ways to make your workplace welcoming and make you want to spend time there? Those of us who have been planning to organize the basement or clean the garage know how daunting the prospect of it is. We make it feel like a huge undertaking and keep putting it off, week after week. But you don’t have to dedicate 8-10 hours a day to a project to get it done. Instead, do a little every day and, before you know it, you will see significant progress. Consider opportunity cost of what you are doing: what opportunities are you missing if you engage in a particular activity (such as surfing Facebook or watching TV)? Use that information not to instill guilt for choosing sub-optimally, but to motivate yourself to accomplish something of value to you. Think of it this way: someone might come home and fall into their routine of watching TV for 3 hours. If you instead spend 15 minutes on your garden and 15 minutes exercising, leaving yourself 2.5 hours for other things, you are already ahead of the game. Add these efforts up throughout the week, and you will have a distinct result; whereas if you choose to just collapse on the couch upon getting home every day, you would be where you were a week ago, if not further away from your goal. Moreover, if you do dedicate a few minutes each to various endeavors, you’ll soon find that you’d rather do something productive than veg out, and you might also find that switching between different activities gives you more energy. You can then choose to spend this energy in other productive or relaxing ways. Have you ever played The Sims? It’s so gratifying to arrange the furniture just so, to plan the garden, and to govern their lives. 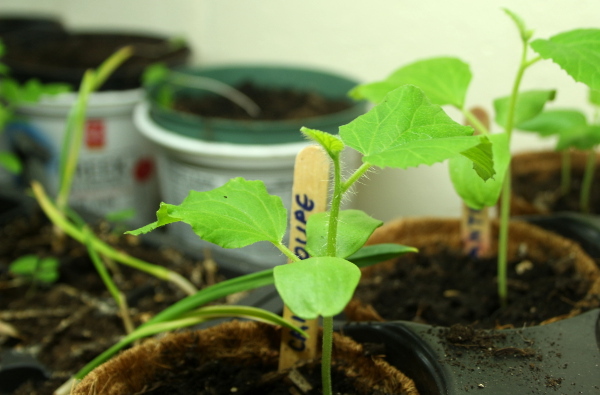 There is a sense of accomplishment as they keep their plants healthy, exercise regularly, and climb the skill ladder in sciences and arts by studying a bit every day. I used to love doing this. And then it hit me: if, instead of trying to achieve virtual goals by performing repetitive virtual tasks, I put my energy into achieving my own goals in real life, I might be more skilled in something that matters to me, in a few weeks. I never looked back, and playing Sims became meaningless: why simulate the same reality I can build in real life? I can get way more satisfaction from putting my mind and my hands to tangible projects. Just as with The Sims, when you miss bill payments, exercise, study sessions, or maintenance tasks in real life, your skills deteriorate, belongings get repossessed, and neglected plants and fish die. Consistency is key. That doesn’t mean that your day must become a rigid routine of 15-minute tasks performed every day in the same sequence. It means that you can resolve to put a certain amount of time during the week into each project that currently excites you, find ways to make it fun and invite your family to join you when possible. With the growing sense of accomplishment, you wouldn’t want to go back to doing nothing. Instead, you’ll be excited to take the projects further and to start new ones in the future. There are lots of things that can be done in 15 minutes to further your progress. Choose to learn new things, explore a new game with the kids, try a new yoga routine, go out for a walk on a new route, spend some time with yourself, read a chapter, sketch a picture, water flowers, declutter a drawer. Each activity brings a change in perspective and lets us rest from the day’s work and recharge while getting closer to our goals. Soap and towels need to be there even during the move, so that people can wash and dry their hands. Kitchen – food, freezer food, cutlery, plates, pots, openers, storage containers. It helps to cook and freeze a few meals in advance. Napkins, tissues, and toilet paper stashed in abundance everywhere they are likely to be needed, so you don’t have to go through boxes to find a roll of toilet paper or a napkin with a messy baby in your arms. Daily care essentials: toothpaste and toothbrushes, shampoo, combs. Easy way to determine essentials: go through your typical weekday and your typical weekend day, list everything each family member will definitely or likely need. Ensure to unpack those things first (ideally you’d pack them last and they are in an easily accessible location). Keys, wallet, documents, diapers, wipes, changes of clothes for the kids and adults, medication/supplements, lunch boxes, water bottles and whatever else will be needed on a daily basis. On the day of the move, make beds and set out changes of clothes and bath supplies/toys — bath time and bed time are not going to wait. In our case, this meant setting up two change tables (one upstairs and one downstairs) for the baby with diapers, cloth wipes, spray bottle with wipe solution and clothing. For the older child, we put a dresser into his wardrobe and filled it with several pairs of pants, t-shirts, underwear and socks. Determine where the large pieces of furniture, appliances and electronics will be and set them up as soon as you can. Until that’s done, tackling boxes is hard, since you have nowhere to unpack them into. It also helps to not be tripping over the furniture haphazardly strewn throughout the house. I work from home, so I needed my desk with the computer, printer, phone, and the Internet connection set up. We have two busy children, so we needed to ensure the play room is one of the first things to be arranged and unpacked, letting them play. To be fair, the most enjoyment they seem to have is helping us open the boxes of books, but they are also engaged with their own space and the forgotten toys to explore in the play room. I had a large area of my kitchen floor taken up by plant seedlings that needed to be transplanted (and the floor needed to be freed up for the dinner table), so getting the soil, building the permaculture garden towers and the permaculture herb spiral, creating beds for the remaining seedlings, and hardening off the plants have been a priority from the start. So shaping up the garden had to be done while the house was still in boxes. I did quite enjoy the process though — it made for a nice break from unpacking, letting us play outside in the fresh air and come back in with new energy to tackle more boxes. Freeing up enough space in the living room to maneuver the furniture and fasten the book cases to walls gave us freedom to unpack our knowledge cube of over 60 boxes of books and the fragile china and glasses that occupied a large part of what shall be the zen room — a small den on the ground floor that got filled to the brim with all sorts of boxes. Kids got their books too, which made for a fun unpacking experience interrupted by lots of quiet time engrossed in whatever book their eyes happened to fall upon. Once the big pieces and daily necessities are set up, the organization can take place with less stress. Do laundry as you go — when you have piles of clothes to deal with, it’s easier to split things into whites, brights, woolens, etc. They’ll be easier to sort once they are clean as well. Don’t bother about ironing at this point. What matters is that things in your wardrobe are clean and can easily be found. Take this opportunity to donate the items you no longer need. Sometimes it’s hard to do that before you move because you don’t know whether you might need something at your new house. For instance, until you spend a few nights there, you won’t know whether you would need to keep your small space heater (not so relevant in the summer, but you get the point) or whether it’s made obsolete by an excellent furnace (which will never break down, right?). Make use of organizational aids such as baskets, bins, shoe and wardrobe containers, shelves, and whatever else will make sorting, storing, and finding things easier. We’ve taken a couple trips to Ikea and I’ve found a few of their closet organizing items very handy. All of my children’s shoes, from size 4 to size 10, have filled one and a half shoe organizer, whereas it took 3 boxes to move all of them. 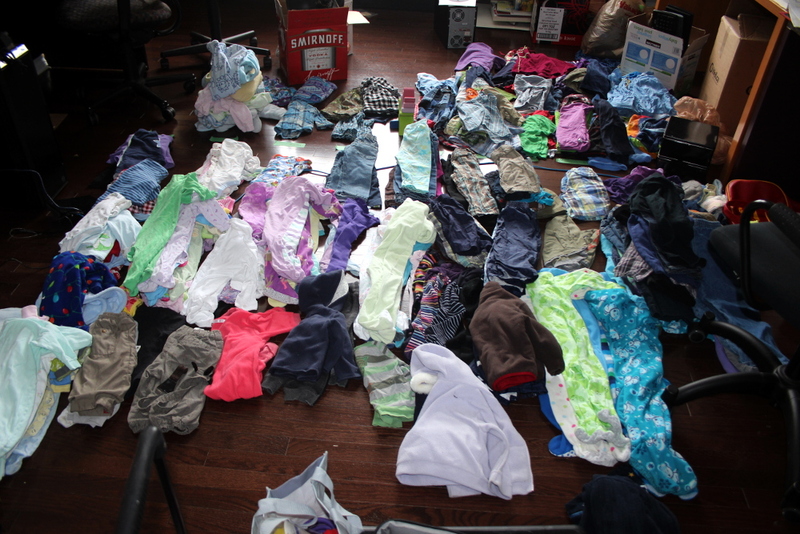 Here’s what I’ve done to organize all the children’s clothing, in about 3 hours. Remember what needs to be done daily — watering indoor plants (and the garden), food preparation, laundry. Take care of those things first and follow with unpacking a few boxes at a time when you have a few minutes. Before you know it, you’ll be through. There is so much to do. Take it one room and one day at a time. Remember to step outside and breathe. You have lots of time to make this place yours. Be gentle to it and yourself in the process. From the time I’ve first mentioned to people that we were moving, I got inundated with an intake of breath and some variation of “Oh, you’ll be living from boxes for the next year”. It’s like getting an exclamation to any issue you might bring up about your children to the effect of “Oh, that’s nothing — wait until X happens!”. Besides not really being helpful, such a response creates a sense of doom (as if somehow you are not in control of when this “living out of boxes” stage will be over), ramping up stress and seeming to suggest that you might as well give up and accept any lack of organization for months on end. As if making an effort to sort through your belongings in an efficient manner is way too stressful, whereas tripping over them and spending hours trying to find essentials is less so. Well, I refuse to give in to this attitude. Some people are skeptical when I say it won’t take me longer than a month, but after 2 weeks at the new place, unpacking in the evenings and on weekends, I have organized most of the clothes, books, dishes, and toys. I have a functional kitchen which needs re-organization but is usable, I have a completely functional and organized master bedroom with the wardrobe, all the bathrooms, my studio workspace and beading desk, the library/living room with the book shelves, and the play room for the kids. Now I am working towards tidying up the studio, re-organizing the kitchen, making my son’s room more cozy, and putting up pictures and mirrors. The house is functional already. The garden is almost completed as well. We have welcomed guests from out of town during this time, and I have already hosted a Pathways Connect meeting and a Blessingway in my living room. The most of the remaining work is in the basement and the garage, but those items are not essential and they are starting to clear out already. Don’t get fixated with organizing everything perfectly from the start. You are in a new home and your usage of various items might change as you adjust to the new environment. My kitchen is bigger than before and, after cooking in it for a few days, I have different ideas of where items would be more conveniently placed. The house will shape yourself around you, so focus first on sorting things out into different rooms. The activities you perform in each room will guide you. For example, all my beading, photography equipment, sewing machine and fabrics, various art and craft supplies have been taken to the studio and stashed in a corner, until I’m ready to unpack and sort them. All the musical instruments, yoga mat, singing bowl, contemplation books and art are going into the zen room. Pantry items and food preparation supplies belong in the kitchen, most of the books — in the living room, clothes — in appropriate bedroom closets. Once the generic sorting is done, it’s easy to tackle a box or two when you have a spare few minutes, making a visible dent in what might have seemed a mountain. Don’t give in to the despair brought on by the sheer amount of things that need organizing. Instead, think logically, divide and conquer, and take it as an opportunity to arrange things the way you like them. Here are some more unpacking tips. Over the past five years, we have accumulated a collection of several garbage bags chock-full of children’s clothes, from newborn to size 5, three boxes of shoes and boots, and bulky winter coats of various sizes. This is the reality of a mother with more than one child, where the clothes are being used at two different sizes by two children. With the recent move, I have been faced with the need to arrange all of them into some semblance of order. One of our rooms has a large double-closet, and it seemed like a perfect place to organize everything. I couldn’t take a picture of the initial pile of clothes since it came in so many bags and boxes that I just kept bringing them into the room in a conveyor fashion. 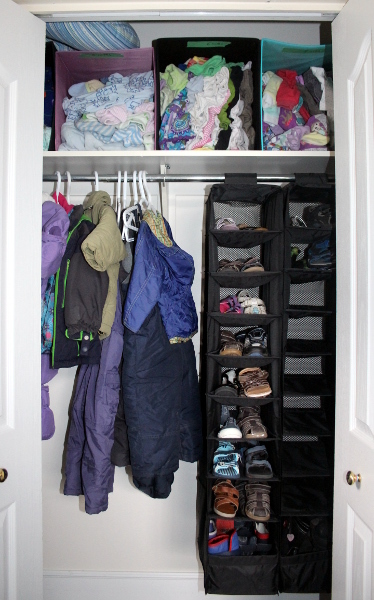 Here is how I organized all of the children’s clothing, shoes, and coats. Quite a few got donated. I used 9 bins, 3 shoe containers, and 20+ hangers. Step 1. Rip up several pieces of painter tape, write the clothing sizes on them and stick them in a row on the floor to mark where to place clothes of each size. You can see the green painter tape in the picture near the blue cable that runs horizontally across the floor. Step 2. Sort the pants, tops, dresses, sleepers, jackets in separate piles on the same vertical axis associated with a single size. This makes it easier to match the length of items that are listed as different sizes or use different country sizing (for instance, sleepers that are listed as 24-months and 2T are often of the same length). I chose to not have a “newborn” category since my babies are pretty tall, and I’ve picked the bottom size where a range is specified for the same reason (so, if it said 12-18 months, I put it into the 12-month pile, since that’s usually when my babies would start using it). I have also separated hats and winter accessories (scarves and mittens) from the rest of the clothes. Step 3. 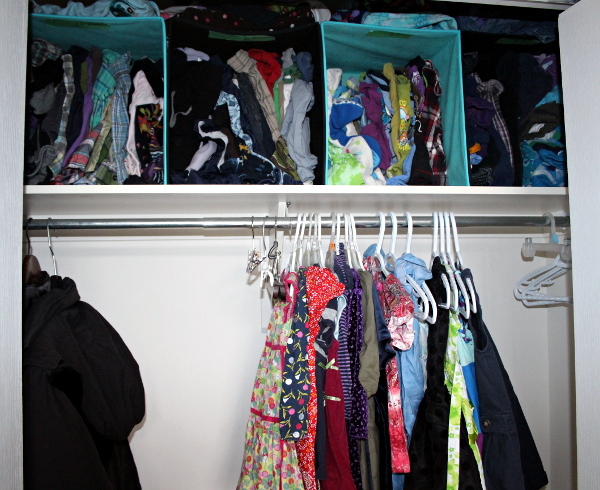 Put the dresses, coats, and snow pants on hangers, arrange them from smallest to largest. I kept dresses separately from winter clothes, as they are needed during different seasons. Step 4. Line up the bins at the top shelf of the closet if you have it, or wherever else you have convenient space for them. Step 5. Collect the piles of clothing for the same size, put them into a single bin. 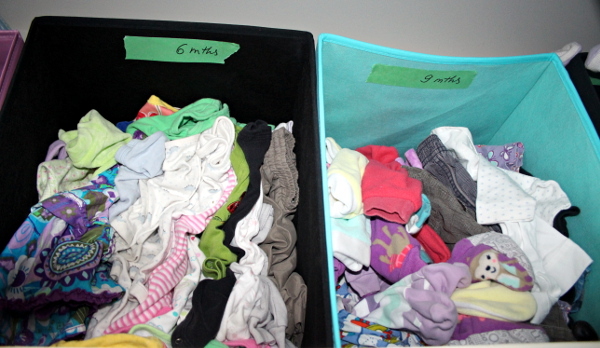 If there are more than one bin can fit, split them logically: I had to split off warm sleepers for 3-month size into a separate bin, since I use quite a few of them. You can also use the space on top of the bin for the rarely-used items of that size (I’ve used it for warm sleepers of larger sizes). If there are not enough to fill a bin, you can combine two sizes together. I had to do that for the 18- and 24-month sizes. Step 6. Take the painter tape with size you’ve used to mark the floor areas and attach it to the inside of the bin, so you can see at a glance what size the clothes in that bin are. To sort the kids’ footwear, I’ve done pretty much the same thing, lining them up by size. This makes it easier to see which sizes are lacking and which shoes you can donate. Once they were sorted, I put them into the shoe containers, going from smaller to larger, two pairs per each compartment, so that the two different shoes (one from each pair) are visible from the front. This way I don’t have to worry about what size they are (I never remember what size my kids are wearing, since as soon as I start remembering, they grow out of it) — I can just try the next size up. The bottom compartments are larger, so I put the rain boots and snow boots there — there are not many of them, so keeping them by size is not as critical. This way of storage for the footwear is extremely efficient: I haven’t even used up 2 out of my 3 shoe organizers. The hats and winter accessories went into the second shoe organizer — the small size of the compartment is perfect to keep them in one place. I still have lots of space in the closet which I’ll likely use for grown-up winter coats and footwear. The whole process took maybe 3 hours (and I’ve been interrupted a number of times), and now I have all the kids’ clothes readily accessible. Moreover, I can see at a glance what we have and can add more clothes into an appropriate size without a need to sort through lots of existing items. Those of us who have experienced birth know that you cannot control what your body does to birth the baby. You prepare and plan as much as you can, and when the baby is ready, you let your body take over and guide you. For me, birth has been the ultimate surrender — I have embraced the loss of uncertainty and have focused on riding the waves that brought me to the shores of motherhood. The two days I birthed my two children are the days I’ve felt the most alive in my entire life. If you know who you are with solid certainty, once you find your centre within the new reality, you can then build more supports to get established anew. You can find your comfort zone and enjoy the calm, keeping in mind the need for flexibility, come the new gale. A good balance of comfort and certainty on one hand, and flexibility and uncertainty on the other, is essential for an exciting journey that does not result in the mountain of stress crushing you, or in the loss of interest in life that has become a rigid routine. As a personal example, my family is currently going through several major changes at once: we are moving (which, with two small children, is not for faint-hearted), switching jobs and office locations, nurturing a teething baby and a child with a cold, welcoming guests from out of town, and planning and planting a garden. planning a menu, cooking and freezing meals in advance to ensure we do not fall back on poor food choices due to lack of cooking time or supplies. For the unknown factors, we leave ourselves open to improvisation, pull in resources as needed, and make sure to breathe deeply when things don’t go as expected, to find solutions from a calm state of mind. Take care of what you can control, bend like a willow with the wind, and embrace the uncertainty. Many people are under the impression that, once you have children, the days become a never-breaking routine, leaving no space for adventure in your life. In my experience, with children around, the routine can turn into an adventure at any moment. The dynamic is quite different, true, but I find that interspersing established patterns and free-form experimentation can work quite well to keep our days interesting and get things done. We are in a process of moving, switching office locations and jobs, with the baby teething and breastfeeding lots at night, and the older child being in turns excited and apprehensive at the chaos. The cat is getting more bewildered by the day, renovations are taking place in the new house, relatives and friends are coming to visit from out of town and we are planning a new garden remotely. Any one of these factors would significantly affect our routine. Together they send any semblance of order tumbling down, and this is where free-form organization shines. Keep some patterns stable as much as possible: bed time routines, dinner, reading with kids. Lock in important dates, equipment rental times, and childcare. Avoid planning too much in a single day, instead keep a running list of tasks with due dates, prioritized by urgency. Seize every opportune moment to complete one of the more urgent tasks off the list, inching (or leaping) closer to the goal. Remember to rest, get adequate nourishment, and have fun. The events around our house purchase and the weekend following it had thrown a few spokes into our wheels. 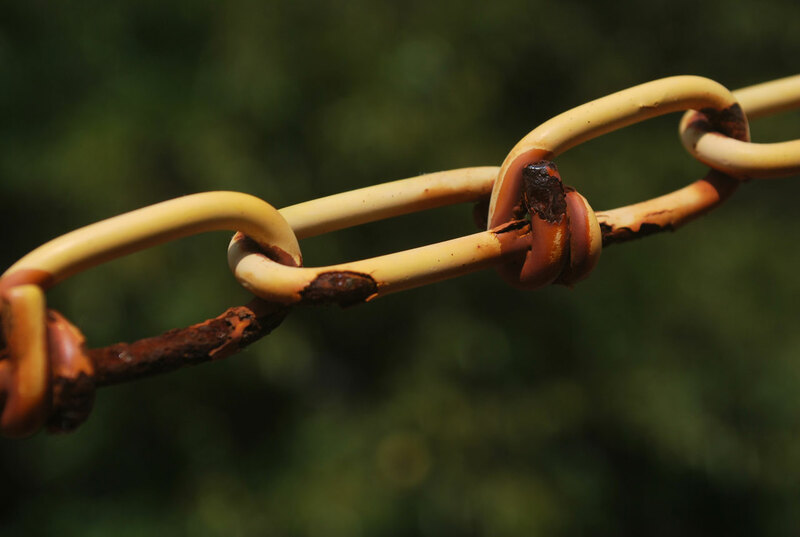 Our moving adventure is full of good examples of how one could adapt to changing circumstances. We knew we were getting the keys to the new house on Friday, May 15th, and the timing had to be flexible, depending on when all the paperwork from both lawyer offices got submitted. There was about a 5% chance that the purchase would not get registered by the end of business on the closing day (why this has to wait until the day in question boggles me — it would be so much more logical to do this in advance), but we were hoping for the best, as we needed to start moving boxes the next day, and the contractors would have to start on Monday. The house purchase is a big step for us, so I also wanted to properly acknowledge it. I have planned a lovely celebration at the new place, and have loaded the supplies into the car in advance: toys and books to occupy the kids in the empty house, spare clothing if they get messy playing outside, cushions to sit on, cutlery, napkins, sarong for a tablecloth, a box to serve as a table, a delicious Thai take-out dinner that I have acquired during lunchtime, and a bottle of Veuve Clicquot with the champagne glasses from our wedding. Advance planning is great for surprise evenings. We ended up receiving the keys 15 minutes before the close of business, on Friday before the long weekend (I had to make a dash downtown during rush hour to acquire them), making the timing really tight to gather everyone from work and childcare and head off to the new house. 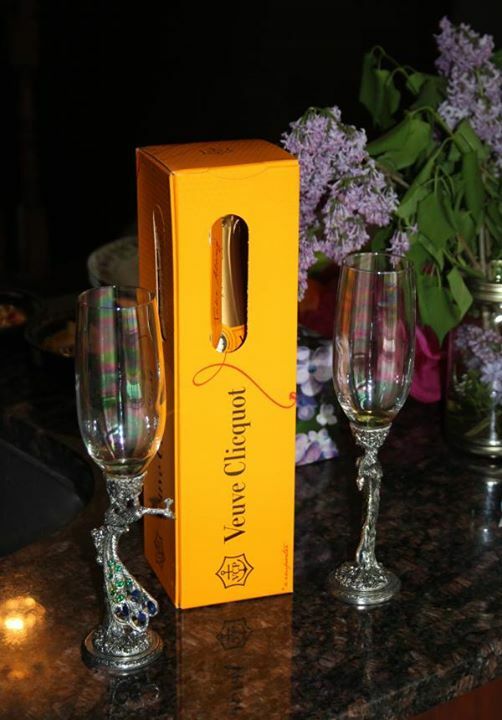 Flexibility and mobility on the closing day, combined with advance planning, made for a lovely celebration. To make the move efficient, my partner and I have decided to move fragile items and various boxes by ourselves, so that we had more space to pack the rest of the items and didn’t waste time of our friends who would come to help us move the furniture on the following weekend. To this end, we have lined up childcare for the Saturday following the closing date, and have rented a cargo van. The rental has been locked in weeks before, and I made sure to have lunch for us at the new place, to keep up the energy. The box move went well — there were two of us and we made three trips between 10am and 7pm, moving books (our “knowledge cube” of over 60 boxes at this point), clothing, most toys, pantry and kitchen items, puzzles, transformers, paintings, posters, fragile items, most of my beading studio, and various odds and ends. The puzzles alone (boxes of undone puzzles and stacks of completed puzzles) filled an entire van. Yes, I know I’m an addict. I can stop at any time I want. I just don’t want to. The puzzles had to be stacked up in the living room, as by the time we moved them we had to return the van. We planned to move the puzzles to the basement the next day, so that they were out of the contractors’ way on Monday. We have also met the contractors at the new house in the morning — they were dropping off wood for the renovations taking place the following week: removing all carpet and replacing it with hardwood. It was an efficient move and a great workout, made possible by well-organized team work. Straight from the move, we went back to my friend’s place. She had our kids for the day, playing with her kids, and was hosting a Blessingway in the evening, for which we stayed. Being at the Blessingway, surrounded by wonderful mamas, helped us shift the energy from the go-go-go all day to a contemplative pace. We were there to support a friend — a strong VBAC mama, to reconnect with the kids whom we haven’t seen all day, to replenish our energy with food, drink, and conversation. Towards the end of the night, we have realized that the keys from our old place might have been dropped on the ground at the van rental parking lot, so we had to retrace our steps and, thankfully, there they were, on the ground. It was a lovely evening, and as we got home around midnight, we skipped the bath time for kids and all went straight to sleep. We have accomplished what we needed for the day, the kids were happy to have company of their friends during the day and lots of attention in the evening from us, we took time to switch activities and enjoy an evening with friends before the next day’s challenges. Sunday morning, after a late start and a delicious breakfast of bacon and eggs, we went to a landscaping center, to pick out river rocks for the permaculture herb spiral we are planning for the new garden. Despite the heat, our kids had lots of fun — the oldest was climbing all over the rock pile with me, picking the biggest and most beautiful rocks. The youngest was observing the proceedings and playing with smaller rocks. It gave our son a sense of accomplishment, helping us with useful work towards the garden project, and we made it fun, playing outside in the sunlight. A few days before the closing date, the washing machine that was supposed to come with the house, gave out. After a discussion with the seller which uncovered previous issues with the machine, we have decided to get a new one, and so after the rock picking adventure we headed to an appliance store. Normally such shopping would have been tedious for kids, but we have done our research in advance and knew exactly the model we wanted, so the process didn’t take a long time. Opening appliance and drawer doors to inspect the insides made for a fun game for our son. We had a filling lunch, followed by getting the kids to sleep, at which point my partner stayed home with them, and I went back to the house to paint quarter rounds that were going to go over top of our new floors and to be there for delivery of the soil for our new garden. This is where things went askew. The quarter rounds had stickers on them — at least three apiece — which needed to be peeled off before any painting could be done. That took me about an hour (and a few broken nails), during which time I have found out that the soil got delivered to a neighbour several doors down, across the street. The delivery company failed to call us in advance, as they promised, and had delivered to a wrong house. At this point, it was after 6pm. 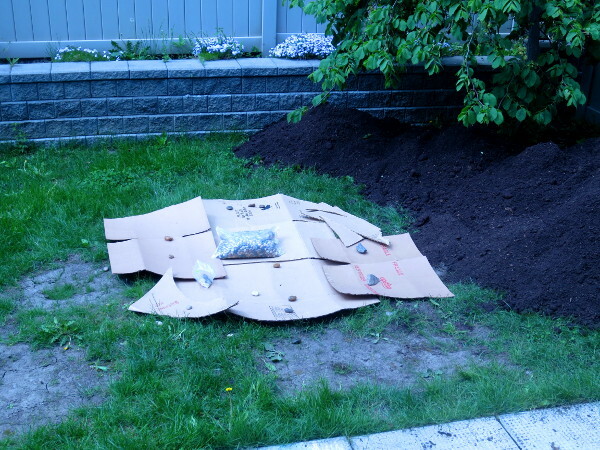 So, clearly, the painting was not even started, moving the puzzles had to be postponed as less critical, and we had to relocate the soil from our neighbour’s driveway. This is where flexibility was important — we had to mobilize. I have found a friend who was willing to come help, and together with my partner, with a wheelbarrow and a garbage can, they have moved 3 square yards of soil in about 4 hours. In the meantime, I was entertaining the kids — prowling the back yard, exploring the new house, playing with balloons, toys, books, and dancing to music. After dinner (I had cooked lots in advance of this busy weekend), I got both of them to help me unpack various kitchen and pantry boxes: the kids were occupied, playing and feeling helpful, while the kitchen was becoming more usable and we were acquiring empty boxes to bring back for packing other things. The soil was moved by around 10pm. We all had dinner, kids had lots of play time, work got done, and kitchen boxes were unpacked. We were flexible to put aside the painting and moving of puzzle boxes for later. We were fortunate to have a good friend who was available that night. We were resolved to put in the energy to move the soil, to unpack the pantry, and to keep track of two children, one of whom was bouncing off the walls and another insisted to be walked everywhere (unable to walk by herself yet), especially up the stairs. We decided to skip the bath time once more, and go straight to sleep, once we got home. The next morning (Monday of a long weekend) brought another surprise: despite our contractor’s reassurances that holidays were not relevant to his crew, none of them have shown up. We proceeded with moving the puzzles to the basement. The washing machine was delivered in the morning. 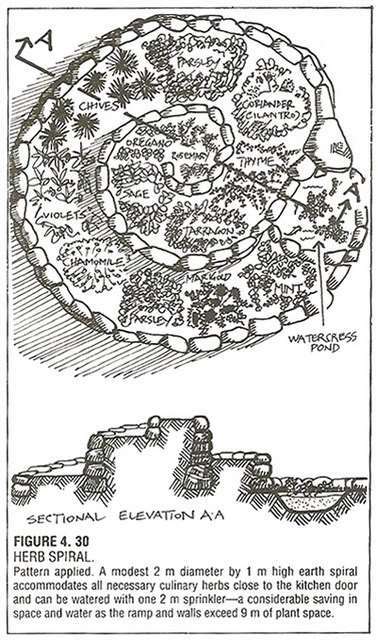 Kids initially played outside with me, drawing an outline of the permaculture spiral with a piece of string tied to a stick, marking the spiral circumference with river rocks, discovering the lost toys in the dirt, and covering the grass with cardboard. Later my son insisted on helping with the puzzle relocation which made for a fun game for them. My daughter calmly opened up a puzzle box and became very intent on watching puzzle pieces stream through her fingers. When they got tired, my partner took them out to explore a local park, while I finished up with the puzzles. The park adventure didn’t last long, as desire for food and rest grew. We went home and had some lovely homemade soup for lunch. I have found an email from our contractor in my inbox, letting us know that — oops — his crew did think a statutory holiday was important (as I anticipated), and the work would start on Tuesday instead. This has, naturally, extended the timelines we had established, but because I had built in a buffer between the planned end of renovations and the furniture move, the impact has been minimized. As the kids fell asleep, I went back to the new house, to attempt painting the quarter rounds once again. I have succeeded. It was a lovely quiet three hours, where I got to focus on the painting and got so inspired, I’ve also decided to paint three pillars inside the house, as their paint was peeling off. I loved the contemplative, uninterrupted time when I could be attentive to detail. With my kids being fed, happy, and asleep under a watchful eye of a loving caregiver, I could throw myself into a project to make our new home brighter. I went back home, the kids were up, and we’ve decided to enjoy a family-centered evening. I’ve barbecued some farm-bought sausages, dodging an indecisive rain with my son under a huge umbrella. I’ve fried up some potatoes and steamed some veggies. We had a delicious dinner with refreshing sangria, followed by a leisurely bath time for the kids. To look back at the weekend, despite all the factors outside of our control, we got everything planned done (although not in the order anticipated): all the packed boxes and lots of fragile items have been moved, we’ve attended the Blessingway, picked up rocks for the garden, got the wood and washing machine delivered, freed up space for the contractors, and painted the quarter rounds. 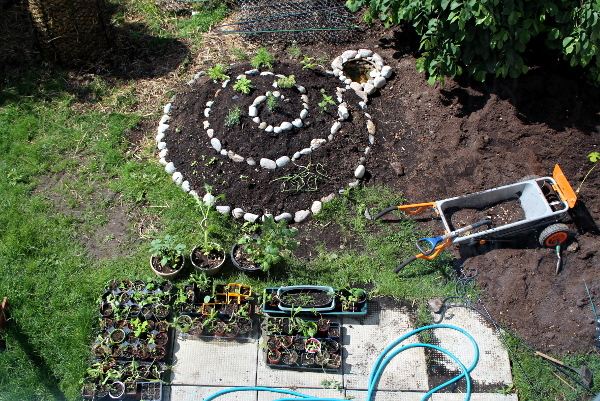 Unplanned, extra things got done as well: pillars got painted, kitchen and pantry boxes got unpacked, soil ended up in our garden (as opposed to being on our driveway), permaculture spiral got started. Through all this, we haven’t been missing meals, kids were happy, fed healthy meals, were playing lots with us and with friends, spending time outside and participating in the move, which made them feel helpful and appreciated. For my partner and myself, there was physical exertion, satisfaction from bringing our cozy home reality closer, time to relax and connect with each other and with friends. As a bonus, there is a more manageable environment at the old place for the following week, before we move the furniture and the existing garden equipment over. This could have been a stressful, frustrating weekend. Instead it was full of joy, connection, and productivity. A bit of an extensive example, but I just want to show how powerful flexibility, combined with some advanced planning, can be. Lock in important times, arrange childcare, remember to take care of your needs for nourishment, sleep, relaxation, connection and appreciation, involve kids whenever possible, and be flexible about the rest. We cannot control what happens to us, but we can control how we react to it. Stress is often multiplied by internal dialogue, self-blame and vivid imagination, painting detailed pictures of what can go wrong. Events are neutral — they happen. It is the way we perceive them and react to them that becomes our reality. If you are stuck in traffic on the way to work and are running late, it’s just that — you will be there later than anticipated. You could accept it as a given and resolve to leave the house earlier to avoid this situation in the future. Or, instead, you can sit in the car seething at the red lights and the drivers in front of you, all the while imagining how angry your boss is going to be, how you will certainly get fired, which will force you to sell your car and have to resort to begging on the street for a piece of bread. Chances are, when you arrive, at most you shall receive a reprimand. More likely, no one is going to care what time you came in. Yet your brain will have you believe that you have lived the frightening reality of being left without a job. That will set the stage for the rest of your day. These stressful responses to everyday situations accumulate and taint your ability to be calm, reasonable, productive, and happy. When you are faced with a less-than-optimal arrangement (and we all go through plenty of those on a regular basis), take a deep breath, identify what upsets you and choose to react to it in a constructive way. If you are stuck in traffic, you can listen to music, sing, think of pleasant plans in the near future, or plan your next errand. If you are stuck in the car with kids, you can play a word game, sing, recite short poems, look for red cars around you, count trees or houses, or find another way to use this time for bonding. Control your exposure to other people’s negative thoughts and emotions — layered on top of your own, at a stressful time, they are likely to overwhelm your ability to effectively mitigate stress and can lead to sleep disturbances, interfere with effective functioning of your digestive and immune systems, slow down your mental responses and land you into more stress than before. Plainly put, you will get more sad and sick if people surrounding you are sad and sick. And when we are sick, we are no help to anyone until we take care of ourselves. Choose not to attend events or meet with people that you know will trigger a strong stress response. This does not mean avoiding friends that are having a hard time. It means knowing when you can be a helpful listener and when you cannot. If you have overwhelming levels of stress in your life, you will only mirror your friend’s negative emotions by getting more frantic, upset, angry, or depressed yourself. All of that will get projected back at your friend, growing the negativity as a snowball that can engulf both of you. You can still help by providing a meal, helping out with kids, or doing something that will be of assistance to your distressed friend, but will not involve a lot of interaction. In many situations, it is the chores and responsibilities that aggravate the stress and get in the way of recovery, so taking on some of those responsibilities is a good way to help. Other people can lend your friend a shoulder to cry on — it does take a village to help. On your part, while you are making a meal, doing laundry, washing dishes, or helping your friend with some other chore, your mind can detach from the immediacy of your own stressful reality. For those of us with strong empathic nature, the intensity of any negative emotion is reflected and multiplied. We take on other people’s emotions and feel them as our own, so we collect even more negativity (and positivity as well) from around us and integrate it into our lives. We end up living our own stresses manifold. To limit your exposure to negativity, control your atmosphere, including the music you listen to, the films you watch, the people with whom you interact, the news you watch, and the newspapers, magazines, and books you read. You know what triggers you — do not expose yourself to it unnecessarily. There are external stimuli aplenty to keep you on your toes. If you feel that your negative emotions have reached overwhelming levels, step back, assess the situation and get some rest. Switch the activities in which you engage: garden, instead of watching TV; do a puzzle or play a board game, instead of reading a newspaper; go to a park with kids for some fresh air and free play, instead of browsing Facebook and soaking up other people’s frustrations. Remove irritants from your environment, be that light or noise pollution, frequent interruptions, or furniture getting in the way. Step outside, take a deep breath, get a massage, meditate, listen to some calming music, play an instrument, play with a pet — find something that takes your mind off the stress, and the solutions to your challenges might just come to you, once you are rested. We are moving, and this means that for the past month and for the next couple of weeks we are living among boxes, and in constantly changing surroundings. 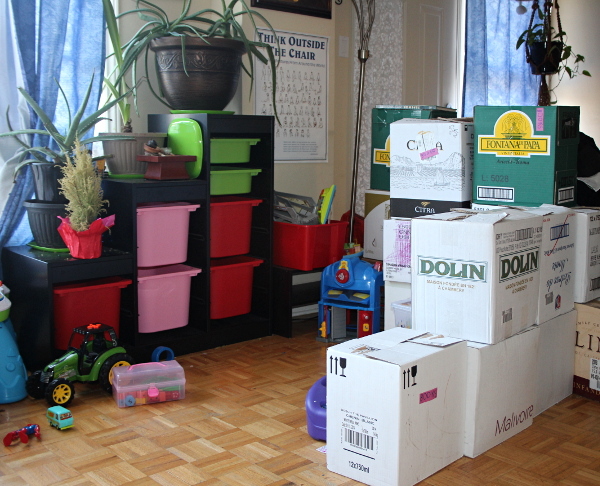 When you have children, adults with hobbies, a full-fledged beading studio, a large library, a network, and a pantry, it makes for quite a few things to pack. A minimalist friend of mine came to visit during the early stages of packing and exclaimed: “I don’t know how you can stand it, I’d go crazy having to live like this for even a week!” Any change in routine is stressful, full of unknowns, and can be downright scary for children. I have come up with ways to minimize everyone’s stress and make packing more fun. For children that have been living in the same place their entire life (and in our case, born in that same place as well), moving is like starting a completely new life. They don’t know what is going to change and they fear everything changing, so they cling to the familiar. Verbal children try to understand what it means to move. They do not know why the move is happening and are often apprehensive about the changes they think it will bring. We want to alleviate as many worries as possible, reassuring them about things that will stay the same and explaining why we are moving and what will be better at the new place. The more you connect with your children at this time, the easier the move will be on the entire family. Talking through the reasons and the expectations will also help you wrap your head around the move, figure out the logistics, spot gaps in your preparations, and calm your own worries about the move. Have meal times stay the same — reconnect, talk about the day, set expectations for what the next day will bring. Reading time — even if your books have been packed, leave a few for the kids. Consider using the library — we go every two weeks, kids pick the books they like, and for the next little while we have new books for them to enjoy. Bath time — leave the bath toys unpacked until the last days: knowing they can play with their favourites helps the children unwind before bed. Bed time — with work, chores, errands, and packing, the time can be tight in the evenings. Try packing without moving the children’s bed time too much. Pack with the children while they are awake, by making it into a game; or (if you absolutely have to) pack after they’ve gone to bed, without moving their bed time too much. Missing sleep is a sure way to raise your stress levels and get sick, so don’t be too ambitious on the days you have a lot of work: pack a couple of boxes at a time. A little bit every day does add up. Playing at home — do not forgo playing with your children for the sake of packing. They need to know you are still there for them. Play dates — make an effort to get out so that the kids can play with their friends. On a weekend, one parent can take them to a play date, while the other takes care of moving preparations. Going outside — if the weather is good, playing outside can do wonders to relieve the sense of being cooped up among boxes. Go as a family (you too need a time to breathe and get some sunlight) or, once again, split the responsibilities by having one parent watch the kids and the other pack. Going to library, skating, soccer, yoga — whatever activities you usually enjoy with your children, try fitting a few outings in. A change of perspective helps us re-focus and come back into the challenging environment in a more resourceful state. 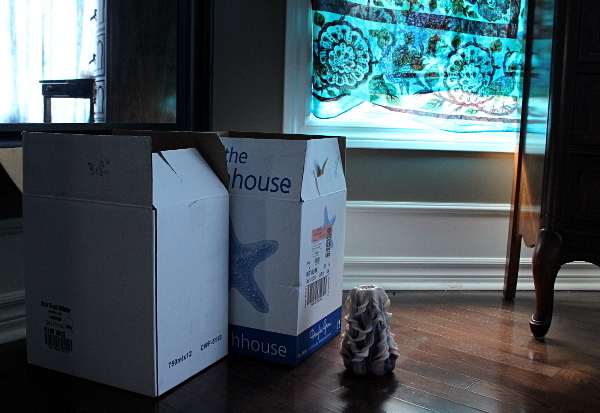 Boxing books and toys — even young children can help with packing books by handing them to you. Toys are a bit trickier, since kids want to play with every long-forgotten toy they see, but, looking on the bright side, you can keep packing other things while they are delightedly occupied. Book packing can be tricky if your children are just learning to read — my son insisted on reading the title of every book which did slow down the packing a little. I kept packing books from another shelf, however, and he loved the reading, so this arrangement ended up being quite effective. Recycling and picking toys to donate — moving is a good opportunity to teach the kids about donating and to reinforce what can be recycled or reused. They might enjoy sorting recycling to determine whether it goes into the paper or plastic/metal/glass bin. Going through clothes drawers — this is a great opportunity to play dress-up. My toddler loves pulling clothes out of bags and stuffing them back into bags, trying a few over her shoulders in the form of a cape. 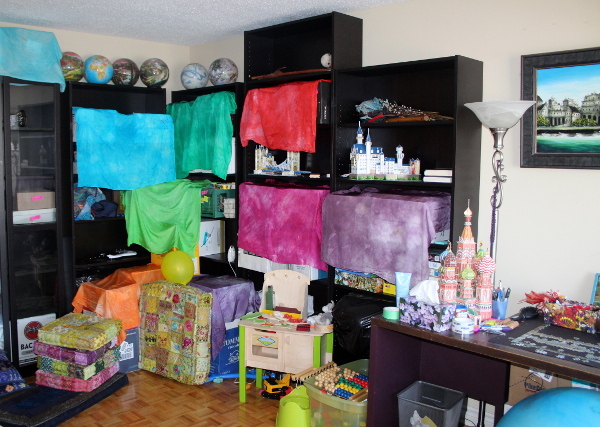 Providing strategically placed bags into which to place clothes can turn the clothes packing activity into a game. Build forts and walls from non-fragile boxes — this is a winner at our place. The boxes with books are serving as walls of a castle, and in place of a baby gate, to prevent our toddler getting to the stairs. Both kids have a lot of fun sitting “in the castle” playing or reading. We keep the fragile boxes on the empty book shelves away from the children’s reach, and use the sturdy book boxes, maximum 3 high, as bricks for the castle wall. Be sure things are not going to topple onto the kids. We’ve had this setup for over a month — our box walls are very sturdy. Decorate boxes — it gets quite daunting to be surrounded by boxes, especially if, like ours, they are a mismatch of colours and sizes. We pick up the free boxes liquor stores have after their shipments come in, and there are many coats of armour, patterns, logos, and large letters that are fun to colour. My son enjoys drawing on the boxes. And to make the room more pleasant to be in, I’ve used some of the Waldorf play silks to cover them up, giving the arrangement a more festive look. Any colourful fabrics — scarves, sarongs, curtains — could work for this purpose. Walk-along boxes for toddlers — our toddler is also learning to walk, and since we don’t have sitting furniture (such as a couch) in our living room where we spend most of the time, being able to walk along the row of boxes (one box tall) is a fun activity for her. Hide behind walls — playing hide-and-seek becomes a lot more fun when there are new elements in the environment to hide behind. Writing labels — if your children are learning to write, this is a great opportunity to practice. I have purchased a collection of sticky notes, to colour-code boxes going into different rooms. My son loves writing the names of the rooms and box contents on the labels. Applying labels to boxes — it’s very much like playing with stickers, with a bonus of being helpful. Children like meaningful activities where they play a helper role. Counting boxes, books, bags, toys — moving preparations offer many opportunities for any child who likes counting. You can teach the kids to count in different languages — we count in Russian, English, and sometimes French. 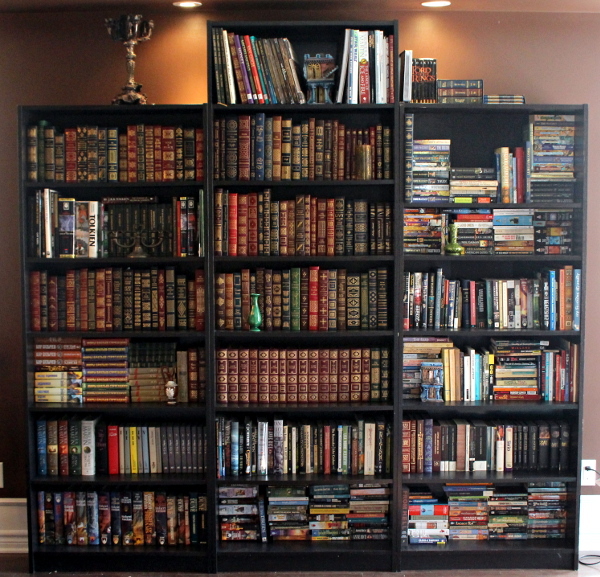 It can be helpful to know how many books can go into a box, how many boxes can stack under a desk, how many bags can fit into a closet, and so on. Find points to highlight — talk to the child frequently about why your new place will be better from the child’s perspective. 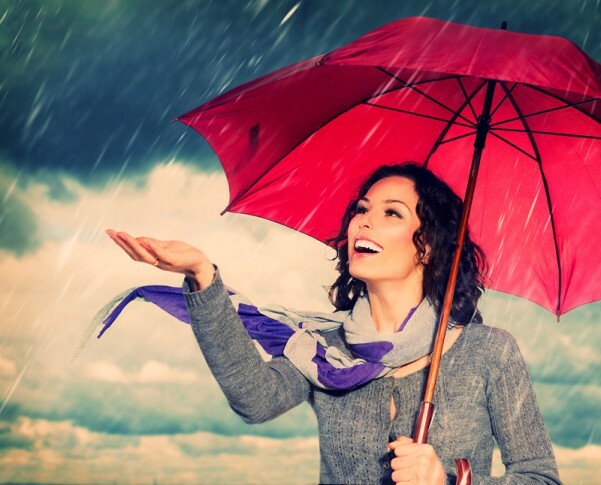 This is a very useful exercise for everyone involved — finding a silver lining in any situation is a stress-relieving technique. This might include a bigger house to play in, a new neighbourhood to explore, a new room that the child can personalize. Getting your own room — as someone who has grown up in a single room that served as a living room, a study room, a bedroom for the entire family, and a guest room for anyone visiting, I know this is a child’s dream. Our son is excited about getting his own room at the new place. List some familiar objects that the child can take with them: toys, pictures, books. My son loves two puzzles that he helped me put together (Shell Game and Tropical Flowers) — they currently hang on the wall beside his bed. I’ve suggested that he puts those up above the bed in his new room, and he is delighted at the prospect. We’ve also talked about having his bed, his desk, and his chair in his room, and getting his own bookshelf. Now he is looking forward to all the control he will have over his environment. Create anchors now — make the children picture the new place and where familiar things will be. Take them there before the move, if possible. If not, draw the plan and show them where their room will be, where they will play, eat, sleep, bathe. Have their imagination help calm their fears and make this move exciting. Parents will still be present — reassure the child that moving to a new place does not mean moving away from a parent (unless, of course, it does, in which case a lot more positive anchoring needs to be done). Parents’ love for the children will remain unchanged — this is the time to express your love for the children even more than usual. They need reassurance that you will still love them, even in an unknown place, and that you are the steady presence in their life. There will still be lots of hugs, attention, and playing together as a family, in the new home. Same breakfast rituals — my partner often makes oat-banana pancakes for a weekend breakfast, and my weekend special is eggs and bacon. The kids love both, and we have reassured them that we will still have those weekend breakfasts after we move. Going to the park nearby to play — our children love playing at a park. So we were sure to let them know there shall be a park near the new place (in fact, there are several) — so we can still go to a park. Going to a library — we are not moving far from our current place, so the library location we visit will stay the same. This is another anchor for the children. Reading books, listening to music, playing with a balloon — we made sure the children know that there is no need to give up these favourite activities after the move. Keep the pictures on the walls — I know some people choose to remove the easiest items first, which includes pictures and photographs from the walls. For us, our place would not be the same without the walls being covered in puzzles, photos, and paintings. If we removed them two months before moving out, the place would feel cold, empty, and unfamiliar, so I have chosen to keep them up until the last week. As a bonus, they take up less space this way, and it’s unlikely a frame or glass will get broken if someone accidentally stumbles into a stack of paintings in our already-tight place. Keep positive and calm about the move yourself. Children pick up on your anxiety and feel strained atmosphere at home when you are not happy. Manage your own stress by getting plenty of sleep, eating well, getting enough downtime, and settling your own discomforts about the move. Take it slow – if you have to give two months’ notice at your old place, it’s a good period of time to get the children accustomed to the idea of a new home (as well as get used to the idea yourself). Make packing exciting — make it a game. Help your children pace the change — take it one day at a time, let them be a part of it, and they will welcome it more readily. Give them a calendar to cross off a day at a time before the move — even a month is too long for a child to comprehend. Do you have any tips for making a move with children less stressful? Please share! Stress is bombarding us every day in the form of external demands and internal pressures, and unless we learn to control the way we respond to stress, it can seriously affect our mental, emotional, and physical health. There are many aspects of family life that compete for our attention, and introduction of a new dependent human being into the mix tends to throw us off balance. 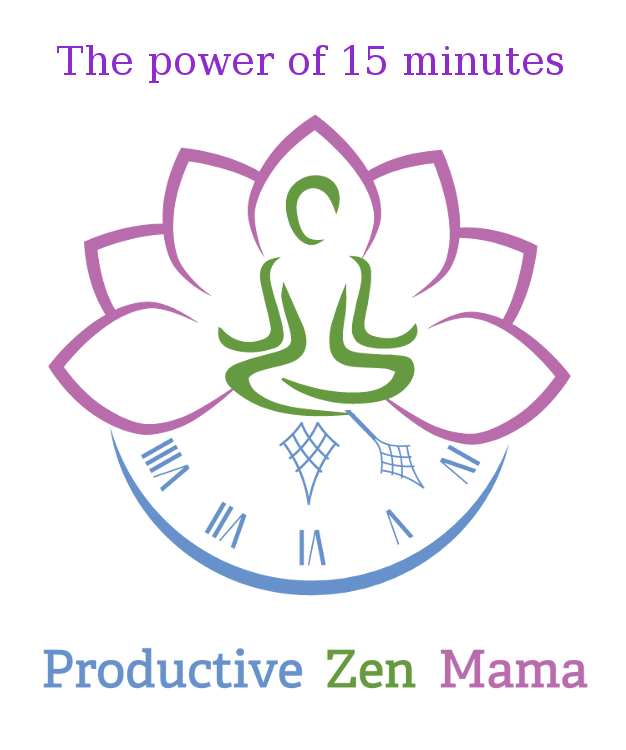 Productive Zen Mama approach is to help women enjoy their time with the new baby, while efficiently running a household, having time to rest, exploring personal projects, and feeling fulfilled. My book Zen Transition to Motherhood is now available on Amazon. It looks in detail into the early weeks after the baby’s birth, with resources to let the new mama rest and recover after the birth, and tips on how to set up a meal train, address mama’s and baby’s health challenges, good supplies to have on hand, and ways to relax and enjoy this time. The second part of the book goes into practical matters of harnessing the new routine, getting chores under control, mastering errands with the baby, and handling commitments. The book also includes many ideas for entertainment and rest. You might pick up this book while you are pregnant or shortly after you give birth. At its core there are gentle parenting principles and a common sense approach to reality. It has been a lovely day this Friday before Easter. The weather has been unusually warm, with a light refreshing breeze, soft sunshine, and birds hesitantly picking at the sunflower seeds in the bird feeder under the watchful eye of our cat. I’ve spent some time replanting potted aloe and various other house greenery and collecting soil from the towers to start various seeds. The kids have been having lots of fun outside for the first time this spring, playing ball, creating Knight of the Realm stories, rescuing available neighbourhood ladybug princesses, and remembering how to shoot a bow. 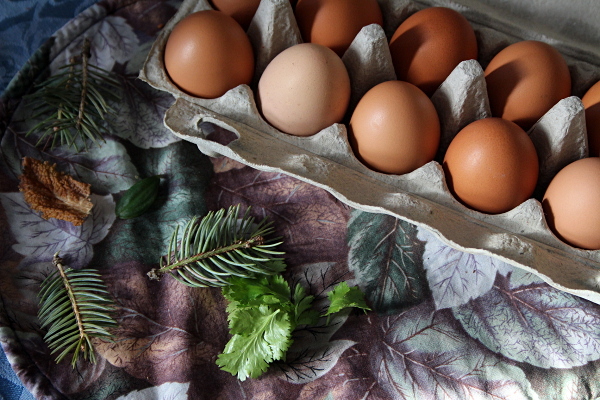 In between planting seeds and playing football, I’ve gathered a few leaves and evergreen branch tips to attempt an egg-colouring experiment under the category of “why not?”. The procedure required minimum preparation and produced pleasant results with minimum effort. 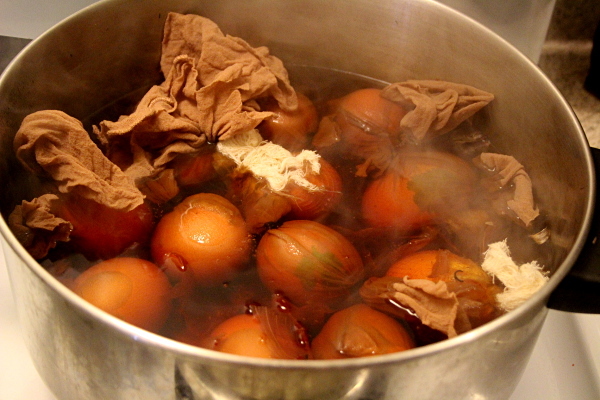 Last year, we’ve used turmeric, blueberries, beets, and onion skins to colour eggs. 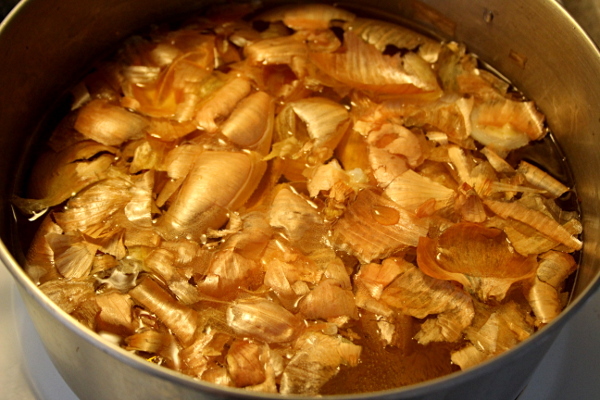 This year, I’ve decided to stick to onion skins only and try creating patterns using leaves and evergreen needles. For this minimal amount of effort, those eggs that had cilantro leaves applied to them came out with lovely leaf patterns. The evergreen needles were too stiff and did not adhere well to eggs, as was the dried kale leaf and the ivy leaf — they have produced a lighter area without any distinct pattern. 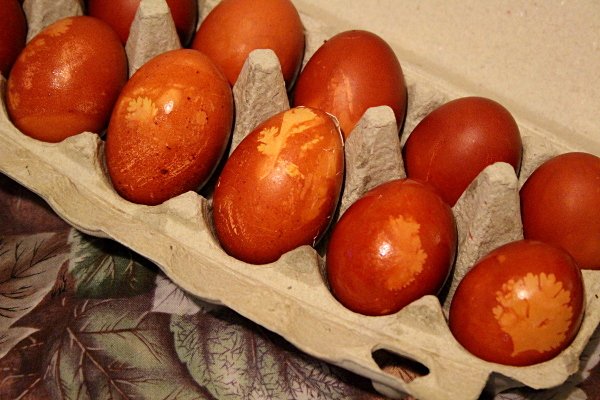 Even without patterns though, I keep marveling at the rich golden brown colour of the eggs dyed with onion skins. 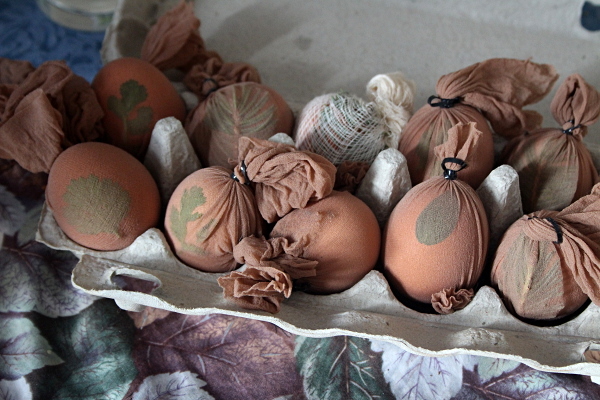 Most of the eggs were on the darker brown side to begin with, and they have turned out beautifully.